Each Thursday for the next eight weeks, host Bruce Madej, senior advisor to U-M Athletics Director Warde Manuel, will be joined by industry experts such as Kim Cameron, professor emeritus at Michigan Ross [and co-founder of the Center for Positive Organizations]; Scott DeRue, Edward J Frey Dean at Michigan Ross; and Melanie Weaver-Barnett, chief executive education officer at Michigan Ross. Together they’ll talk with U-M student-athletes, coaches, and administrators to discuss the relationship between sports, academic study, and success. The goal of “Beyond the Wins and Losses” is to give listeners insight into the value of sports as a tool in society, business, and everyday life. 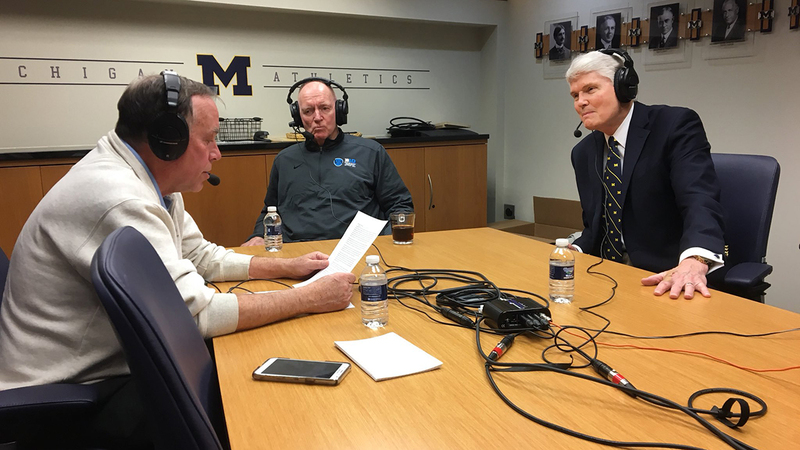 Former NHL player and legendary U-M ice hockey coach and player Red Berenson joins the first podcast of season one to discuss his journey in sport, his strategy in preparing student-athletes to succeed, and his methods for creating high-performing teams and culture. Michigan men’s basketball coach John Beilein, softball coach Carol Hutchins, and men’s and women’s swimming coach Mike Bottom will join future episodes of the podcast. U-M alumna and high jumper Dr. Nicole Forrester, Executive Associate Athletic Director, life coach Greg Harden, and track and field All-Americans Erin Finn and Ben Flanagan also will be featured. Michigan Ross is no stranger to the intersection of business and sports. In fact, Michigan Ross Executive Education collaborates with NFL Player Engagement to design a four-day, customized NFL Business Academy, a program that was initiated in 2014, and organized its inaugural two-day Sports and Organizational Dynamics Conference in February 2018. The second-annual conference will be held in June. “Beyond the Wins and Losses” can be accessed and downloaded on TuneIn, iTunes, and Stitcher. It also is available to stream at MGoBlue.com. This article was originally published as a Ross News Blog post.